This Bookreporter.com Special Newsletter spotlights a book that we know people will be talking about this spring. 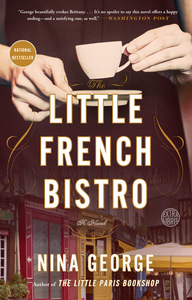 Read more about it, and enter our Spring Preview Contest by Tuesday, March 27th at 11:59am ET for a chance to win one of five copies of THE LITTLE FRENCH BISTRO by Nina George, which is now available in paperback. Please note that each contest is only open for 24 hours, so you will need to act quickly! From the New York Times and internationally bestselling author of THE LITTLE PARIS BOOKSHOP comes an extraordinary novel about self-discovery and new beginnings. - Click here to visit NIna George's website. - Connect with Nina George on Facebook and Twitter.